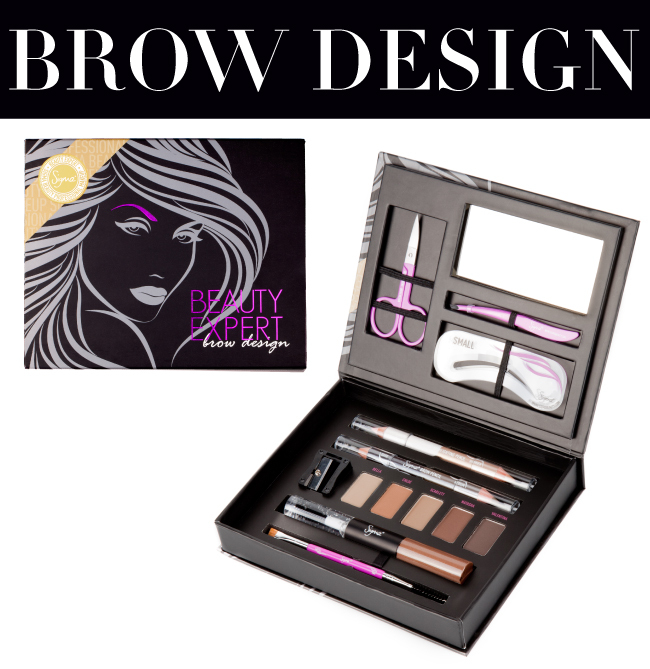 After much anticipation, we’re excited to announce the official launch of the Beauty Expert - Brow Design Kit! This exclusive and convenient brow kit contains all of the arching, shaping and grooming tools you'll need to achieve beautiful and defined brows. Eyebrows frame the face and complete your look, so why not make perfect brows an essential part of your beauty ritual? Today we’ll show you how! Before you begin grooming your brows with the tools inside the kit, it’s important to note what each tool is for and how they're used. 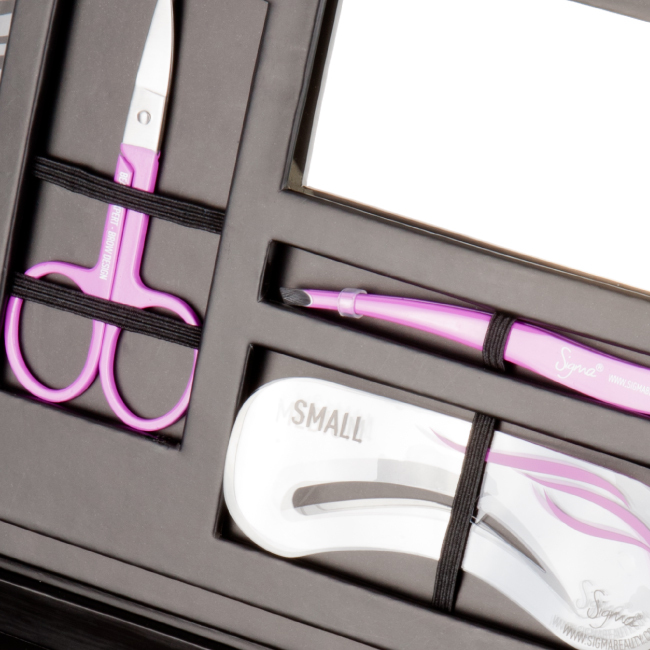 Scissors: specially designed with the perfect length and blade shape for trimming brows. Ideal for trimming long and out-of-place hairs. Tweezers: the pointed and angled edge of this tool makes for easy removal of unwanted hair – a necessity for maintaining groomed and well-defined brows. Brow Stencils (small, medium & large): achieve the perfect symmetrical brow shape! These durable stencils create a template made for easy trimming, filling and shaping of eyebrows. With three different sizes, there is a perfect match for everyone. Duo-ended Brow Pencil (medium / dark): defines brows and adds color. This pencil applies product smoothly and blends easily. The medium shade suits light to medium hair; the dark shade is best for medium to dark hair. Duo-ended Highlighting Pencil (matte / shimmer): perfect for accentuating the brow bone and defining the brow’s arch. Use the matte side to create a soft highlight; use the shimmer side to produce a subtle glow. Pencil Sharpener: keeps brow pencils sharpened and well-shaped for a seamless application. Brow Powder: creates full, natural-looking eyebrows. Builds further definition and intensity of eyebrows when layered on top of brow pencil application. Bella: creates a soft, subtle and slightly warm brow. Ideal for light to medium blonde hair. Chloe: adds a tint of auburn to any brow color for a softening effect. Ideal for strawberry blonde to light auburn-hued hair. Scarlett: a universal shade made to sharpen and enhance any brow. Ideal for dark blonde to medium brunette hair. Natasha: makes for well-defined and evident brows. Ideal for medium to dark brunette hair. Valentina: produces a strong and bold effect to achieve the most intense brows. Ideal for dark brunette to black hair. Duo Brow Gel (clear / tinted): this lightweight gel keep brows in place all day. Use the clear gel for the most natural look or the tinted gel to provide added color and intensity. Dual-Ended Brow Brush (E80 wand / E75 angled brush): use the wand (E80) to brush through brows to target any misplaced hairs; use the angled brush (E75) to apply brow powder to any sparse areas that need filling in. Place the Brow Stencil over your eyebrow, lining the outer edge closest to your nose parallel with your inner eye. Trace along the inside of the stencil using the Brow Pencil. With the tweezers, remove any hair outside of the line made with the Brow Pencil. Take the E80 of your dual-ended brow brush and brush through eyebrows. This allows you to pinpoint any stray hairs that will need to be trimmed. Use the scissors to trim any out-of-place or long hairs. Taking the brow powder that best matches your hair color, apply to any part of the eyebrow that you want to give more definition or color to. Keep brows in place with a light application of brow gel. Finally, accentuate your brow bone by applying the highlighting pencil under the arch of the eyebrow. There you have it - perfect eyebrows made easy! Be sure to stay tuned for our upcoming blog posts that will feature how to use each shade in the kit to create a collection of versatile looks suited for everyone. WOO HOO!!! Already ordered mine!!! I am soo excited!!! Does this have stencils for slightly thicker eyebrows than the one that was shown? I have medium thick eyebrows which I like and do not really want to make thinner.